This is dangerous and not recommended. how secure is Twitter & Facebook? how easily would /could the account be compromised and 'fake information' be spread like wildfire..?? this is a good idea in principle and I would bet my life that Facebook and Twitter will not take on that kind of responsibility/liability if something goes wrong, in fact, would they be around in few years time.. US government/homeland security should just run their own list/information distribute directly from them with secure and proven communications, with authenticate and trusted message (like PGP).. then and only then, would we be able to trust the message. Sadly we are chasing like lemmings, and following the crowd, key part of the internet is not addressed, which is the 'trust' aspect of it all! YouTube - Fox News anchor is pranked on April Fool's Day: "
thanks Andrew for pointing it out! 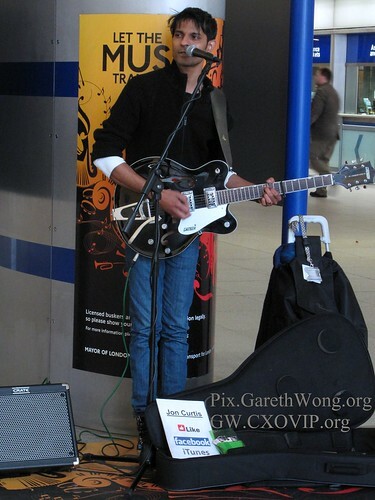 Jon Curtis, great singer songwriter busking in London Tube, A&R guys, take notice and forget the X-factor! (if all his songs are this good)IMG_3369, a photo by garethwong on Flickr. cannot believe he is not snapped up by Simon coward yet..
great voice and if he writes all his songs like this one, guys & girls try and grab him when you can, as he will soon have entourage and you will not be able to get close! check out the song I heard, with acoustics inside tube station.. brilliant, first busker that made me stop, believe me, there are many in London!